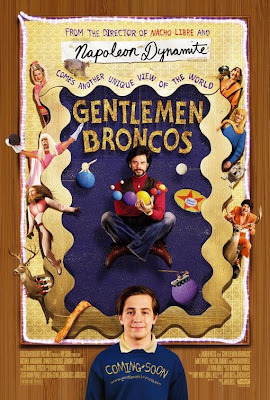 Just about every film critic in the United States has done a real hatchet job on Gentlemen Broncos (reviews have been dismal), which just goes to show you how out of touch they are with the audience this movie is intended for—namely, me and my friends. Four of us went, thought it was hilarious, and had tears streaming down our faces because we were laughing so hard. Three of us were slightly buzzed, sure, but I swear I was stone-cold sober. By the way, the Gentlemen Broncos website is pretty awesome.